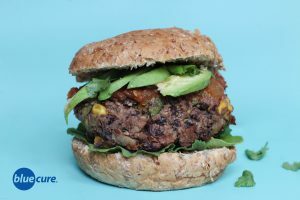 Mexican black bean burgers are a delicious option for summer grill outs or leftovers on a busy weeknight. Make a few batches of these and throw them in the freezer to have on-hand when you need a go-to protein option. Serve these on a whole grain bun topped with avocado, greens, salsa, and cilantro—or crumble them up and use as taco “meat” on a whole grain or corn tortilla. Feeling like eating it salad-style? Chop up some greens and vegetables, crumble up the black bean burger, and drizzle on our nacho cheese sauce for a delicious fiesta bowl! The sky is the limit! 1/8 of the recipe using chickpea flour has ~165 calories, 9 grams of protein, and 8.7 g of fiber. If using chickpea flour, place the chickpea flour in a dry skillet. Cook the chickpea flour on low heat for 10-15 minutes, stirring frequently to avoid burning or overly browning. Toasting the chickpea flour helps to remove some of the bitter bean taste of the chickpea flour in the final product. If using oat flour, prepare the oat flour by placing whole oats in a dry blender. Blend until fine like flour. Set aside the flour once finished preparing. Preheat the oven to 350 F. Chop the onion, pepper, tomatoes, greens. Saute the onion with 1-2 tablespoons of water until the onions are translucent. Add the pepper and tomatoes. Continue to cook, and then add in the frozen corn and greens. Add in the spices and cook until greens are wilted and veggies are tender. Mash the beans in a bowl with a fork. Add the chickpea or oat flour, ground flaxseed, water and continue to mash/ stir until well incorporated. Fold in the cooked veggies. Form the bean batter into 4-8 patties and place on a pan lined with parchment paper a silicon mat. Bake for 30-40 minutes, flipping the burgers ½ way through. 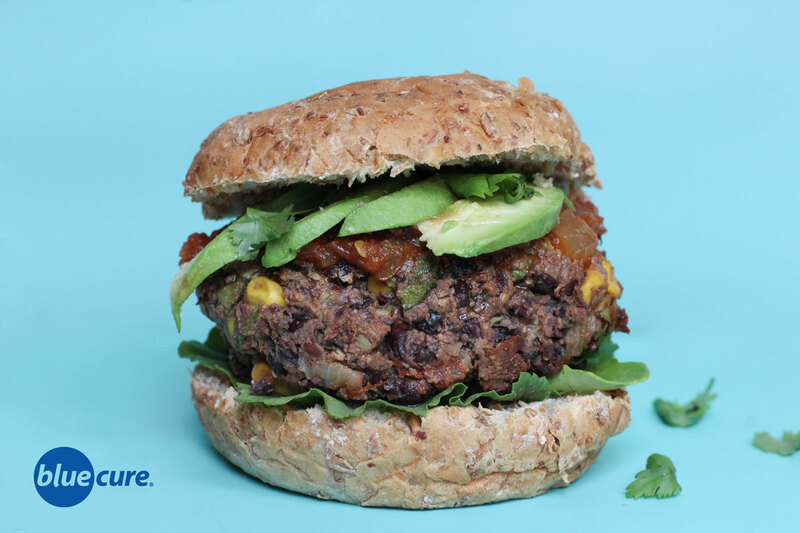 Serve the burgers on whole grain or sprouted buns. Top with salsa, avocado slices, greens and fresh cilantro. Enjoy!